Sisterhood bylaws require Sisterhood members to be Temple members and to identify as female. For Temple men and non-Temple members (both men and women) who want to express their support of Sisterhood, we have a program we call “Friends of Sisterhood.” You become our Friend by declaring your support of Sisterhood through donating an amount equal to what a member pays in dues. Friends of Sisterhood cannot vote in elections or hold elected office, although they can serve on a committee. We hope you will consider becoming our Friend! 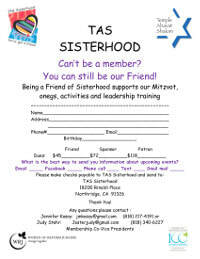 Your donation furthers Sisterhood’s programs, goals, and mitzvot. With you as our Friend we are stronger and more capable. Click on the flyer on the right and print the form. Then fill in the form and return it to the Temple with your donation today!